This versatile & dependable bed is actually a bed, a dresser and a bookshelf unit all-in-one! Built to withstand the challenges of the most aggressive youngster, it will easily sustain all stages from toddler to dorm room! • Slower growing cycles of Northern Red Oak provide a denser and more durable wood for years of enjoyment. • Unlike cheaper particle board with veneers, plywood will not separate providing a much more stable and long lasting case. • Designed to eliminate gaps and the need to align drawers, this type of construction presents a cleaner and a much more stable drawer. • In the "Old World" tradition, each piece is methodically processed to ensure a smooth, maintenance free finish to protect the natural beauty of the wood. Built kid tough, the solid oak Trundle is designed to increase storage with a massive bottom drawer, which is a great toy chest or can double as a second sleep surface for overnight guests. Built kid tough, the solid oak Trundle is designed to increase storage with a massive bottom drawer & Bookcase Headboard. 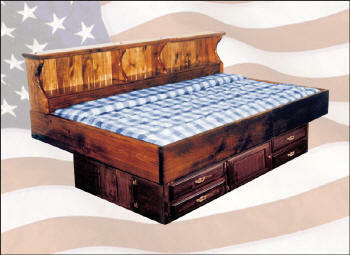 The bottom drawer is a great toy chest or can double as a second sleep surface for overnight guests. 1. 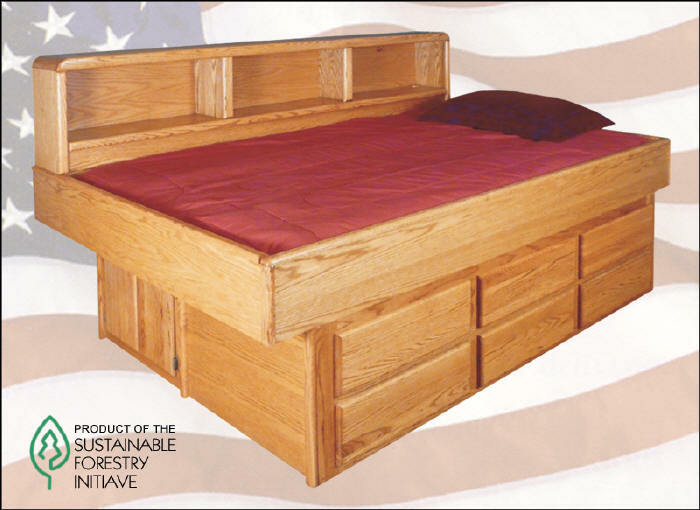 Solid Northern Red Oak trim and fronts• Slower growing cycles of Northern Red Oak provide a denser and more durable wood for years of enjoyment. The new look of this traditional style is clean & simple to compliment any decor while the roomy drawers improve the quality of space in smaller bedrooms. 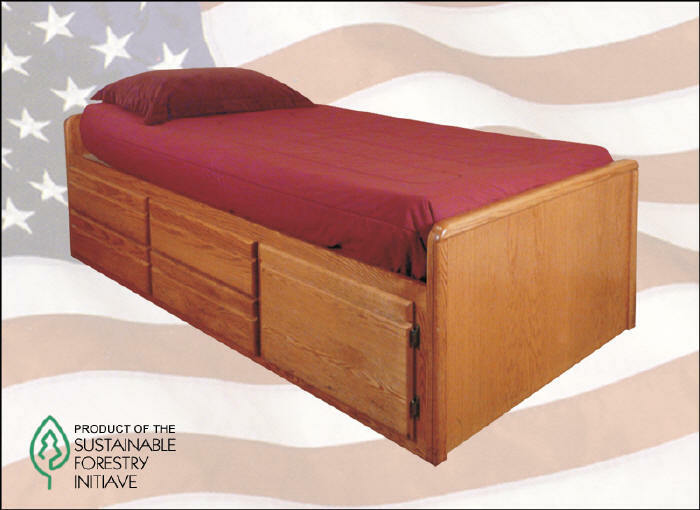 Solid oak construction is tough enough for generations of use! The new look of this traditional style is clean & simple to compliment any decor while the roomy drawers & Bookcase Headboard improve the quality of space in smaller bedrooms. Solid oak construction is tough enough for generations of use! The new look of this traditional style is clean & simple to compliment any decor while the roomy bottom drawers & Bookcase Headboard improve the quality of space in smaller bedrooms. Solid oak0Aconstruction is tough enough for generations of use! 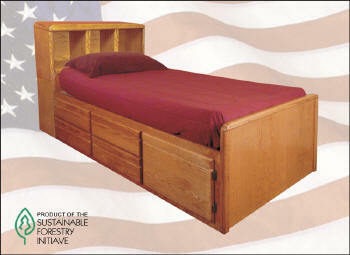 The original space-saver design, this classic mainstay continues to be a leader in consumer demand. 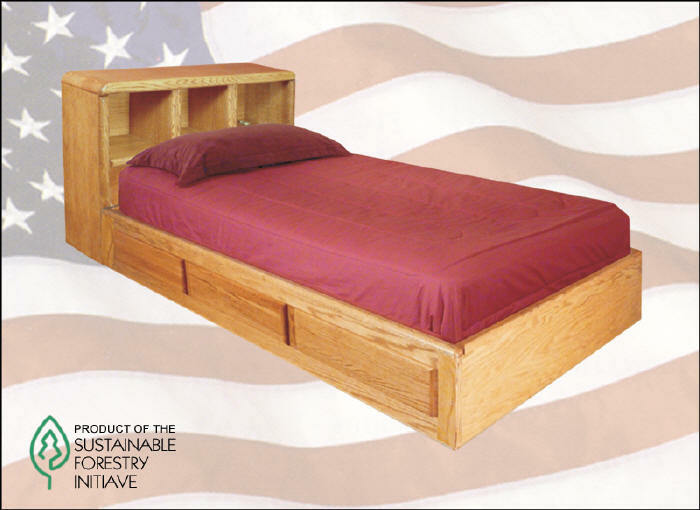 Offering high quality and durable construction, the Pine Youth bed solves the mystery of small bedrooms and growing children. 1. Solid 2" Kiln Dried Ponderosa Pine • Durable enough to accept the challenges of the most active youngster, it is resistant to distortion. 2. Side Mounted Headboard. • Creates additional space in smaller rooms by allowing the bed to be placed in a corner, while providing the storage capability of large bookcase. 3. 6-Drawer Storage Pedestal • The high quality birch drawers provide the storage space of a full size dresser without requiring the additional square footage. 4. Back Side Cubby Door • Fully utilizes all of the space under the bed, yet allows for the maximum free area by placing the bed against a wall or in a corner. Great for smaller rooms. 5. Protective Beauty Buttons • Offers the finished look of high quality furniture and prevents snagging on exposed screw heads. 5. Available in Honey Oak or Medium Walnut Finish • Provides the flexibility of choice to compliment any bedroom. 5. Tongue & Groove Panels • Crafted to provide strength and durability for years of service. 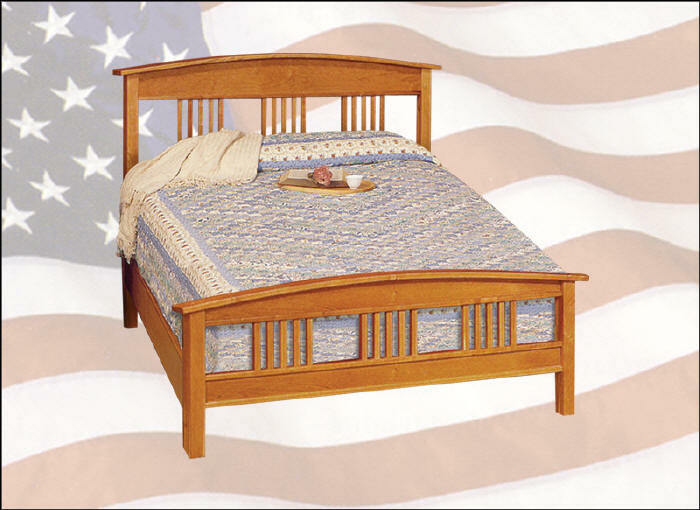 The timeless elegance of Cherry Wood, superbly finished to bring out the beauty of the natural grain, is classically rendered in the Monaco bed! Premium features like Doweled and Corner Block construction, European Blum Glides, and Drawers with Aromatic Cedar come standard in the handcrafted casepieces! 1. Cherry Wood • This hardwood is known for it's fine, tight grain patterns. Boasting a warm, rich natural reddish-brown tone, the wood from the cherry tree evokes elegance and can be described in one word "Beautiful". 2. Solid Cherry Construction • All furniture tops, drawer fronts, face frames and molding are solid cherry. 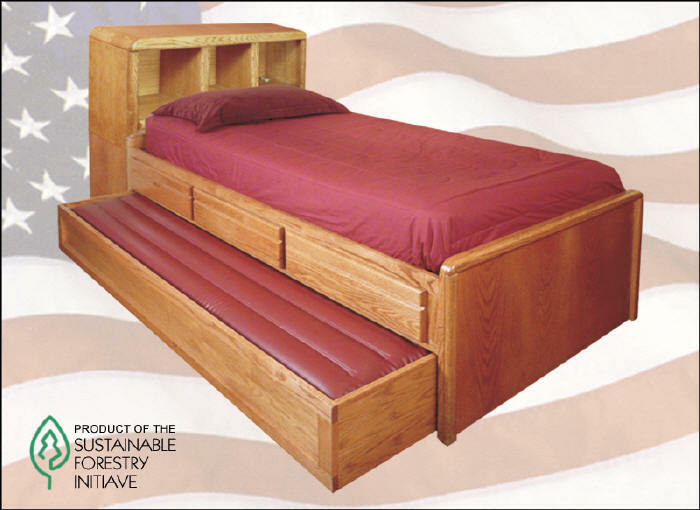 Tops and drawer fronts are solid cherry pieces assembled in a reverse cross grain orientation to prevent warping or cracking. 3. Aromatic Cedar Board Drawers • Top drawers on all casepieces are lined with aromatic cedar to keep delicate items fresh. 4. Dual European Blum-Style Glides • Each drawer features nylon rollers for smooth, effortless operation. A secure drawer stop is part of the design. 5. 5-Piece Drawer Construction • 9-ply Baltic Birch featuring true English dovetailing at all 4 corners. A 3/4" thick solid cherry front with detailed bevel on the front surface. 6. 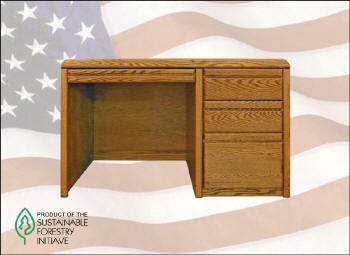 Face Frame Construction • Face frame construction uses 7/8" solid cherry to perfectly match drawer fronts. 7. Internal Corner Blocks • Screwed in corner blocks prevent the casepiece from twisting or "racking". This added touch will ensure that maximum life will be obtained from the furniture. 8. Case Backs • Case Backs are recessed into sides and top assuring the furniture is 100% square. Along with Corner Blocks this recessed back construction ensures a durable long life for the furniture piece. 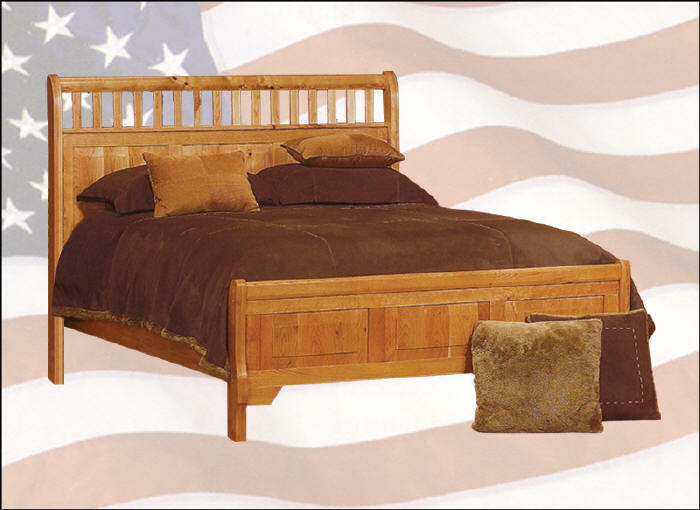 The timeless elegance of Cherry Wood, superbly finished to bring out the beauty of the natural grain, is magnificently shown in the spectacular Robinson bed! Premium features like Doweled and Corner Block construction, European Blum Glides, and Drawers with Aromatic Cedar come standard in the handcrafted casepieces! This solid wood student desk would be an attractive addition to just about any room! Spacious drawers in the desk give plenty room to organize a variety of items. Solid oak construction is tough enough for generations of use! 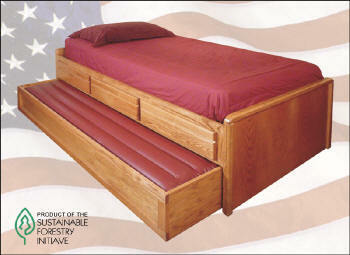 Waterbed Mattress and Waterbed Heater!